general. My happiest places are those made up of culture, life and art. And in a way art works like a closed loop recycling program, not to say that art is just the same thing over and over, no, but rather that one piece of art can be seen, heard or smelled even and another form of art is made, sometimes with little to no trace from it's original inspiration, similar to closed circle recycling, one plastic thing is taken, recycled and then made into another, new, different, unrecognizable, plastic thing over and over. For me at least art works like that in my brain and when I have asked this of my friends who are artist in one form or another they too agree that a painting was made while listening to a list of songs and a song was written while reading a novel and a novel was inspired by a painting and the cycle keeps going with many other forms of art in between. Because, what art does for all of us is to simply, powerfully and wonderfully, move us. How does makeup fit in to this? Well, makeup, though often seen as a shallow form of vanity, is an art form in it's self. Some are novices, some skilled, some masters and anyone who could critically look at how an artists contours a face to show, in greater detail, the skeletal structure within or how someone can see a way to make a person go from sweet faced to menacing could not deny it to be just that, art. 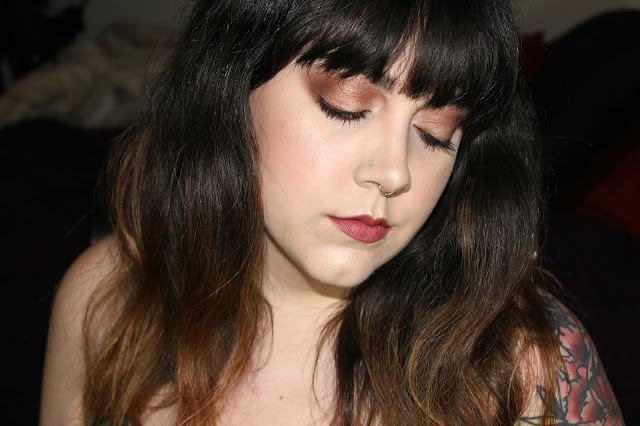 I have been in somewhat of a blogger's block, a sort of lack of inspiration, so, I decided to, for three days, sit at my makeup table, listen to one song on repeat each day, and see what makeup came out of it. I didn't want to have any predetermined ideas of what I wanted to look like as a finished product. Luckily, I had a few days off so I was able to do whatever! Not that at my job I couldn't, but sometimes it's a bit scary for some customers to see me wearing navy blue lipstick and I wanted to be able to do what ever came. I ended up with this angelic glowy look after listening to Bach's Suite No. 1 in G Major for Solo Cello. I had no pre-set idea of what I wanted to look like. No product ideas, just grabbed as I felt inspired. I allowed the music to carry me. Here is the piece of music that helped me create this look. inspired and excited to create again? Let me know in the comments. This first day of three has been really fun and I recommend you give it a try if you have the time. If you don't want to miss day 2 and 3 be sure to follow my blog here or on Bloglovin'. I am also on Twitter, Instagram & Tumblr. Thank you for taking the time to read this post. Each person who spends their time reading something I wrote blesses be in an amazing way.